Oats is good for people working on reducing weight. 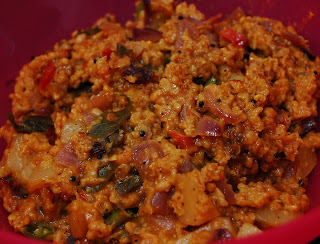 Since oats has good amount of fibre content, it gives a feeling of filling lasting for hours and you dont feel hungry for a long time.This recipe that I am sharing today was written on the back wall of Saffola oats packet and with some variations added into it from my part made it a tasty snack relished by all. You may try it out too. 1) Heat oil in a frying pan. When oil starts to smoke, add mustard seeds and when they start crackling, add onion and tomato. Fry them till they turn golden in color. 2) Then add green chillies and urad dal. When urad dal will turn brownish, add potato cubes, turmeric and salt. Cook for 1 minute. 3) Now add oats. Stir to mix oats with the mixture. Add salt and sugar. Add 1/2 cup of water. Please note adding too much water might make the upma soggy. Add water as much required for cooking the oats and when water completely evaporates and oats seem cooked, turn off the heat. 4) Garnish it with coriander leaves. Serve hot.